Last week’s release of The Book Thief film throughout the UK has given us a gentle reminder of the importance of books and the right we have to learn. 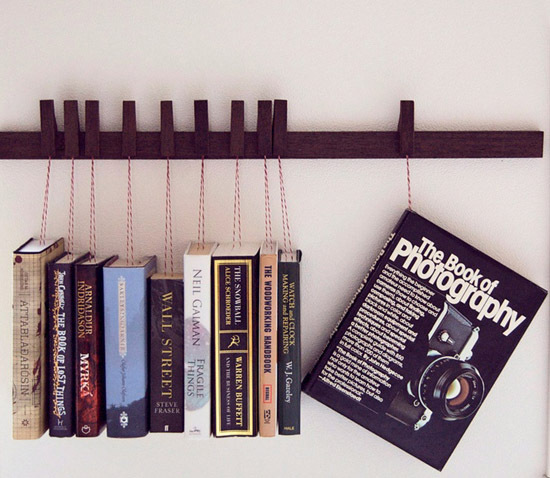 If you’re a bit of a bookworm, you’ll need more than a bedside table to accommodate for your haul. To shake off that book bore label and show that books can be a whole lot of fun, why not indulge in some more unusual displays – from a country shaped wall design to a row of hanging books. Let us know what your favourite is! Designer Guiseppe Vigano has come up with a set of slanted shelves called Primo Quatro for Saba Italia. Inside a minimalist home, the lacquered wood would work well thanks to its simplicity. The geometric shape is formed of a series of repeating structures and the open nature of the design welcomes the movement of natural light – believed to be an important element within minimalist architecture. 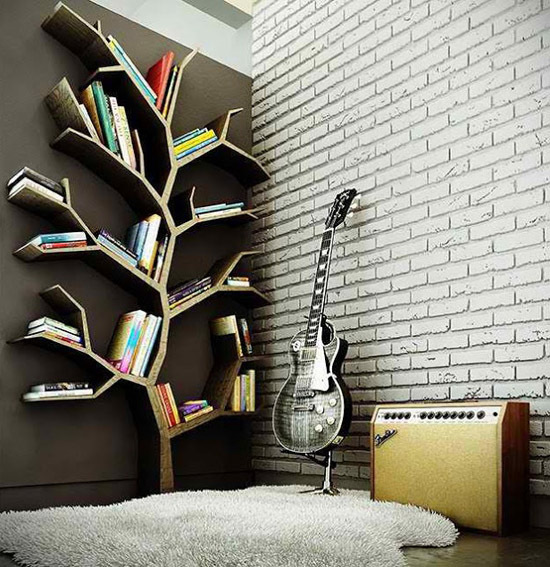 Set at a quirky angle, the furniture is prevented from becoming just another plain white bookcase with a series of perfectly placed, even sized squares in which to place your books. 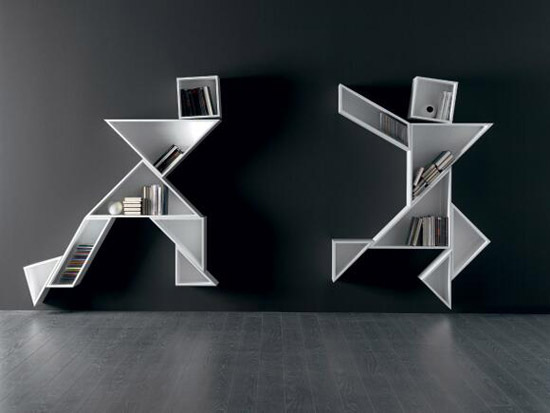 Take a look at Daniele Lago’s bookshelves and you’ll notice that they resemble a man and woman, who appear to be running. They’re more than just that however. Look closer and each shelf is made up of seven flat shapes. These are dissection puzzles called tangrams which are usually put together to form specific shapes using only outlines. Invented in China during the rule of the Song Dynasty before entering Europe via trading ships in the 19th century, the tangram is one of the most popular dissection puzzles worldwide. 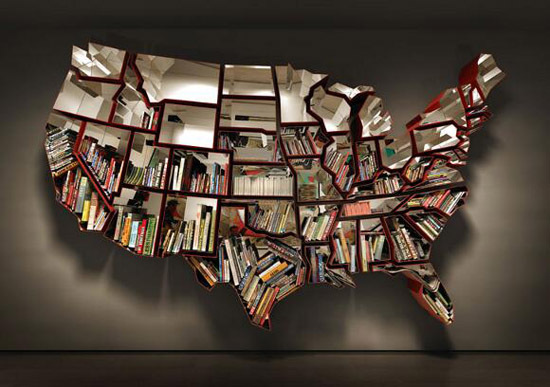 These bookcases aren’t just fun, they introduce history and culture into the home. Hooray for the USA! Or at least the bookshelf. 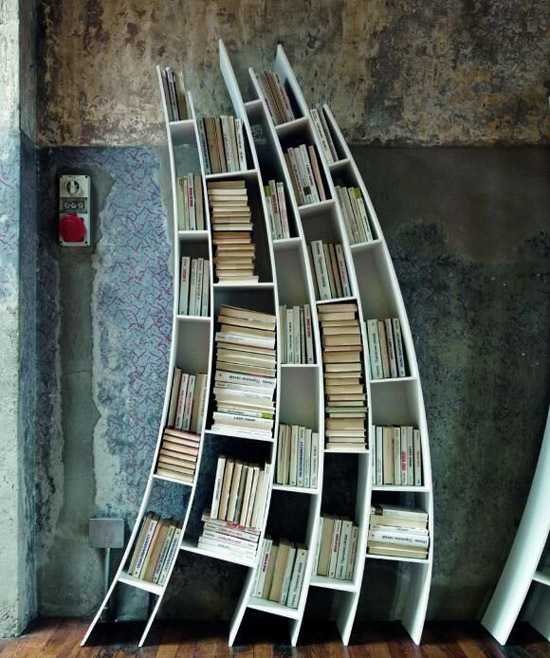 This country shaped shelf by industrial designer Ron Arad is a great pick for the keen traveller. For those with immaculate homes, it can add controlled chaos into the mix – the uneven sized gaps and shapes are jarring, yet playful. However, within a messier room, you could find that it only adds to the unruliness, leaving you wanting to restore order. Great for the study but perhaps not first choice for a child’s bedroom? Finally, we’ve found another use for those barely there book markers in text after text. For a casual approach to storage, why not hang them by a thread (literally) and secure on wooden pegs. As long as the thread is of the same length in each book, you’ll assemble a perfectly aligned book display. If not, would a misaligned display really be such a bad thing? This is my number one DIY pick for its easy installation but could you bear to hang your works of literature in such a careless manner? As a nation, we’ll never tire of bringing the outdoors in. If you’re not the green fingered type, a tree of the wooden kind is a far better pick. What’s so appealing is that it doesn’t matter how many books you have to store, the structure will look put together no matter what. Less of a storage solution and more of a visual statement, it would make a fantastic living room focal point should you be looking for an alternative to a permanent feature wall. Stellabluedesigns have thought up with an ingenious solution for industrial styled homes. If you’re working with exposed brickwork, you’ve probably found that the traditional wooden shelf is at odds with the overall design in the room, leading it to look out of place. 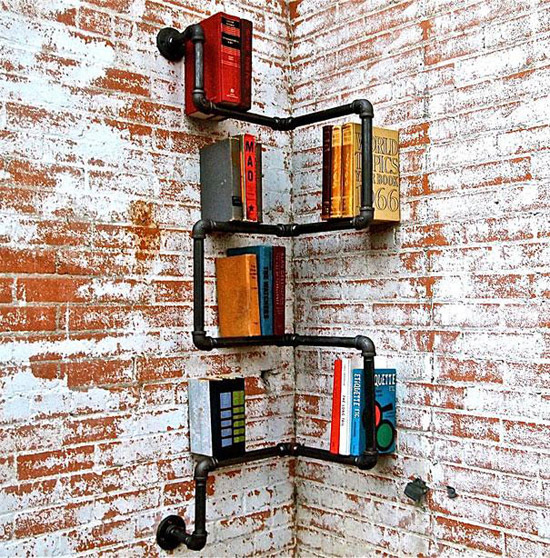 A bookshelf designed to look like pipework gets it right, while providing you with slots to house your favourite books. Larger collections won’t benefit from the limited space allocations but there’s no denying it’s innovative. The built-in bookshelf isn’t as unusual as the other storage solutions that have been referenced, but it’s worth a mention since it unlocks hidden storage within your home. The doorway bookshelf is particularly attractive and blends into your interior space instead of taking up to 24″ of floor space like its free-standing alternative. 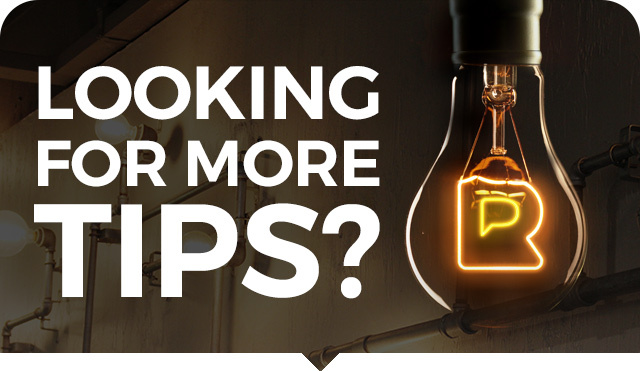 There’s also the potential to easily incorporate downlighters, perfect for adding ambient light to balance the light levels within your home. 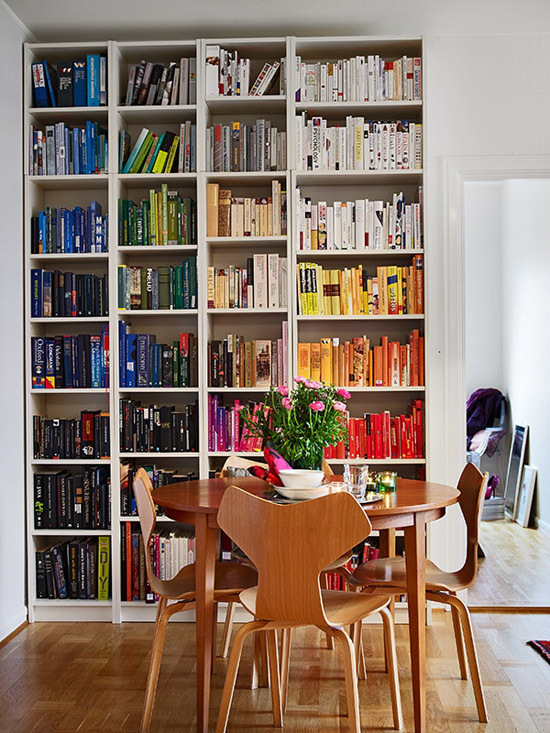 Pushing quirky features aside, the classic square or rectangular bookshelf can have a big impact when you pay attention to colour. In public and home libraries the Dewey decimal system is normally followed to make books easier to find at a moment’s notice. Books are divided into ten categories according to subject – grouping everything from religion to philosophy and geography. In the home though, many of us stick to one type of literature – we like our crime stories or romantic literature and routinely buy books in the same category. Thanks to this, it makes more sense to mix things up and group by colour instead – unless your collection is on the same scale as a library’s! Colour coding attracts the eye and is a welcome addition to neutral rooms which could benefit from an injection of colour. If you’re particular about organisation and like items to be set in their place, you’ll like the balanced display which speaks of an adult approach to storage solutions. If you need help fitting custom bookshelves or could simply do with a handyman to help you fix your shelves, post your job in our Carpenter/Joiner or Handyman categories, respectively. 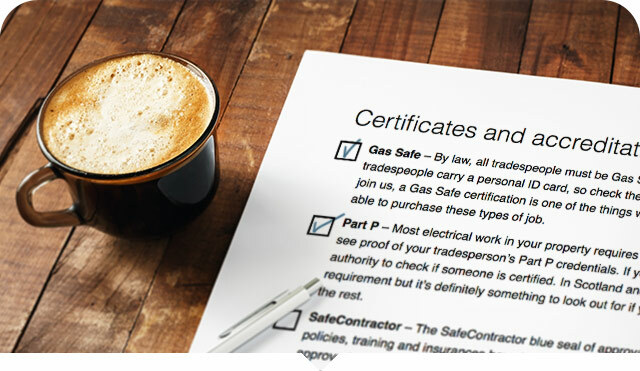 Up to three local tradesmen will get in touch to quote and you’ll be able to view their individual profile pages to help you decide who to hire.